The 10th Asian Games were held in Seoul, South Korea from 20 Sep to 05 Oct 1986. A total of 4,839 competitors from 22 Nations participated in 270 events in 25 sports disciplines. 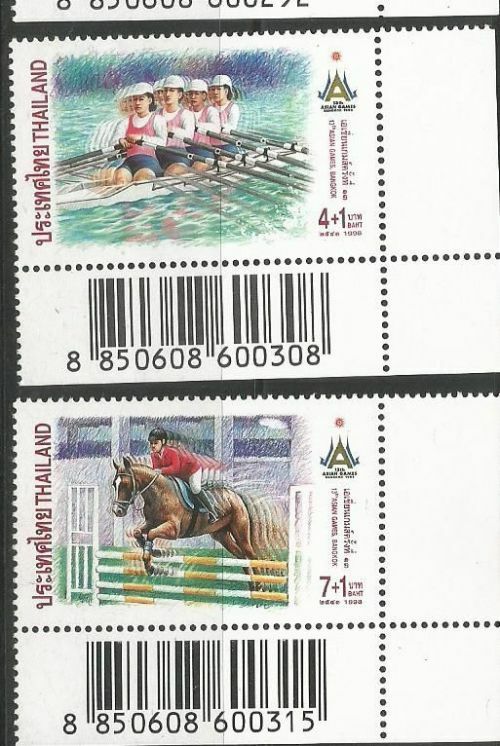 A Set of Stamps was issued by South Korea on 10th Asian Games. Four years earlier, in New Delhi, an 18-year-old P T Usha had won two Silver medals in 100 meters and 200 meters events, respectively. She was deemed to be the most promising athlete of the Games. PT Usha went into the 1986 Seoul Asian Games as one of the favourites in more than one category. She won Gold Medals in 200 meters,400 meters, 400 meters hurdles & 4 x 400-meter relay events. She also won a Silver medal in 100 meters. She was crowned the Queen of Athletics at Seoul. India issued a stamp on 1986 Seoul Asian Games. 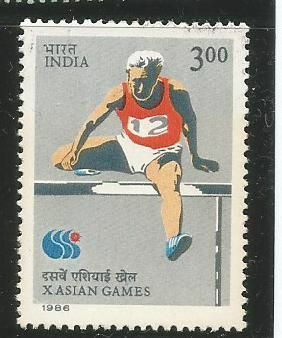 The stamp features an athlete running a hurdle race. The 11th Asian Games were held in Beijing, China from 22 Sep to 07 Oct 1990. A total of 6,122 competitors from 36 Nations participated in 310 events in 27 sports events. These were the First Asian Games held in China. The official Mascot of the Games was Pan Pan, the Panda. 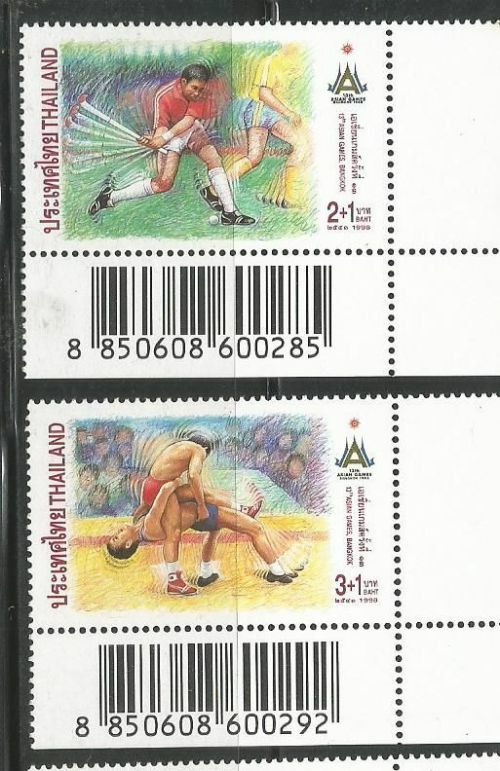 A set of four stamps was issued by Bangladesh on 22 Sep 1990.T he Stamps feature Kabaddi, Wrestling, Badminton.& Rowing events. 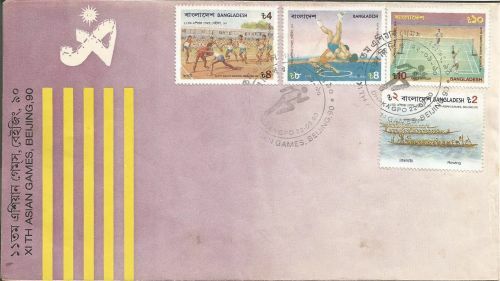 A First day cover with these stamps from Bangladesh is shown below. 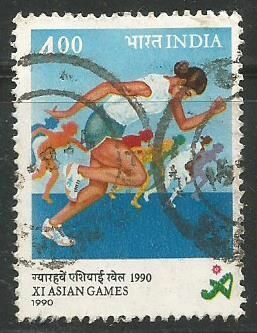 India also issued a stamp on 1990 Asian Games showing a woman athlete. 12th Asian Games were held in Hiroshima, Japan from 02 Oct to 16 Oct 1994. A total of 6,828 competitors from 42 Nations participated in 338 events in 34 Sports. The motto of Games was Asian Harmony. The venue of the Games was the site of first atomic attack 49 years ago. Japan released two stamps to mark the 12th Asian Games. The stamps featured 3000 meters steeplechase event and Synchronized swimming. 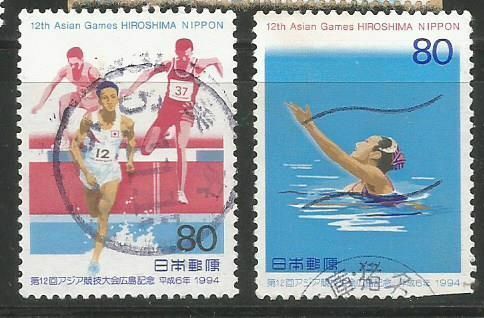 Stamps of Japan on 12th Asian Games at Hiroshima. The 13th Asian Games were held in Bangkok ,Thailand from 06 Dec to 20 Dec 1998. A total of 6,554 Competitors from 41 Nations participated in 377 events in 36 Sports. Bangkok became the first City to host the Asian Games four times. 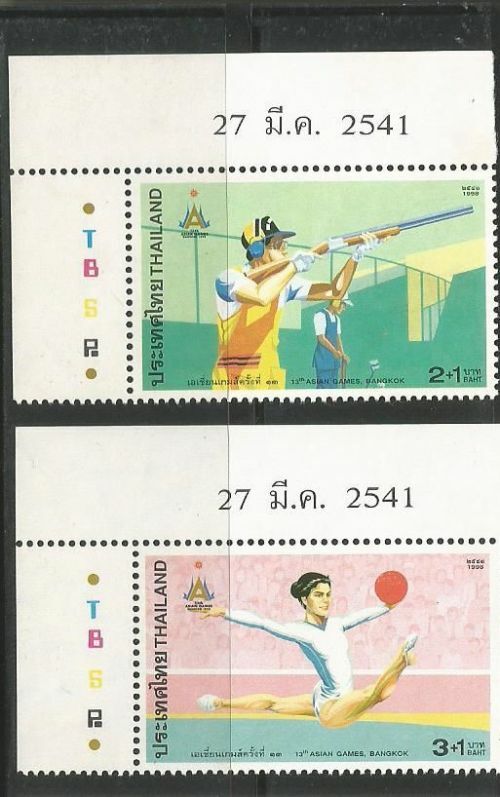 Stamps of Thailand - A set of four stamps were released on 27 March 1998. The stamps feature Shooting, Gymnastics,Swimming & Wind Surfing. 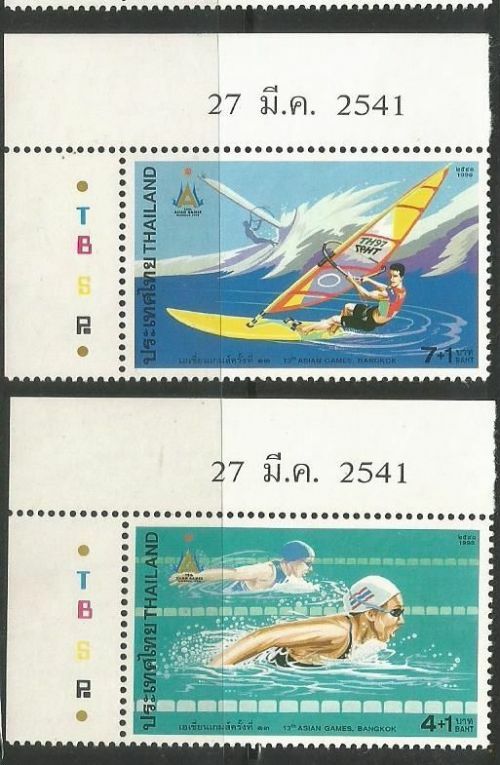 A set of four stamps was issued as Charity stamps with a surcharge on 06 Dec 1998. The surcharge value of the stamps were to be utilized for charity. The stamps featured Field Hockey, Wrestling, Rowing & Show Jumping. 1998 Asian Games with charity surcharge. Miniature Sheet of Hong Kong- A Miniature Sheet was issued by Hong Kong 29 Sep 1990.T he miniature sheet features Billiards, Cycling, Table Tennis, Rowing etc. 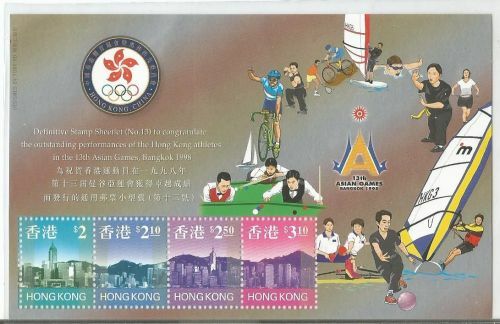 Miniature Sheet issued by Hong Kong on 1998 Asian Games at Bangkok. The 14th Asian Games were held in Busan, South Korea from 29 Sep to 14 Oct 2002. A total of 7,711 competitors from 44 Nations participated in 419 events in 38 sports. Apart from Busan four other cities also hosted some events of the games. 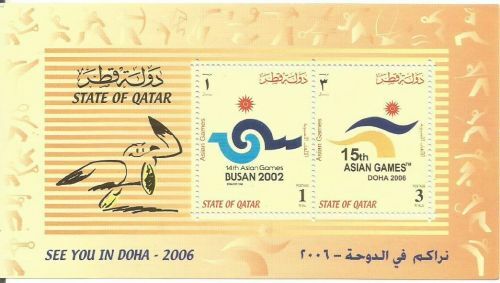 Stamps - A Miniature sheet was issued by Qatar to mark the end of Asian Games at Busan and inviting for next Asian Games at Doha in 2006.